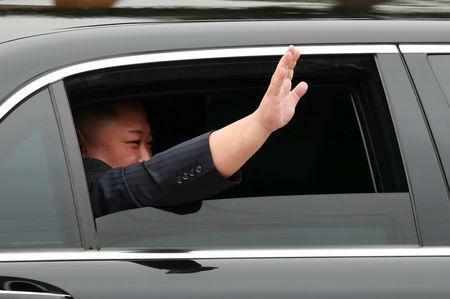 HANOI (Reuters) - North Korean leader Kim Jong Un became the first leader of his isolated country to travel to Vietnam since his grandfather, Kim Il Sung, visited in 1964 when he arrived on Tuesday for a summit with U.S. President Donald Trump. Vietnam's model of reform is being widely touted as the economic path for impoverished North Korea to follow as the United States leads efforts to curb Pyongyang's nuclear weapons program and bring it back to the international fold. But Vietnam's transformation has required political change and levels of individual freedoms that would require major reforms for the Kim family, which is afforded godlike status by state propaganda. In imagery that could have powerful propaganda value at home, Kim Jong Un will mimic aspects of his grandfather's trip to Vietnam by traveling to some of the same locations visited by the elder Kim, two sources with direct knowledge of security and logistics planning told Reuters. "This is legacy politics," said Christopher Green, a North Korea expert with the International Crisis Group. "North Korea will want to play up Kim’s succession to the role of his grandfather, who successfully built up North Korea's international legitimacy after the establishment of the state." 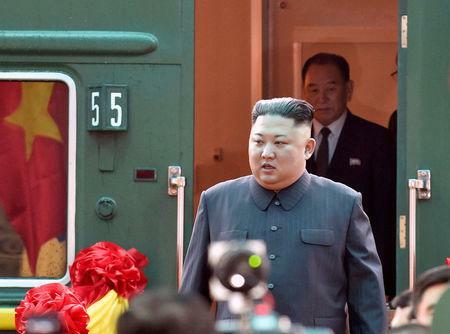 Even Kim Jong Un's long train journey through North Korea and thousands of kilometers across China to reach Vietnam is similar to the grand train voyages his grandfather once took. His armored train is made up of carriages decked out with pink leather chairs and big-screen televisions. In Vietnam, one of his destinations will be the northern coastal province of Quang Ninh, the sources said. It is home to Ha Long Bay, a UNESCO world heritage site dotted with steep-sided islands which attracted more than 12 million tourists last year. Kim Il Sung visited Ha Long Bay in 1964 during his second visit to Vietnam. Kim's train arrived at the Vietnamese border station of Dong Dang early on Tuesday, where he disembarked to travel the 170 km (105 miles) to Hanoi by car. Top Vietnamese officials were on hand to receive him at the station with a red-carpet including a guard of honor and North Korean and Vietnamese flags flying. 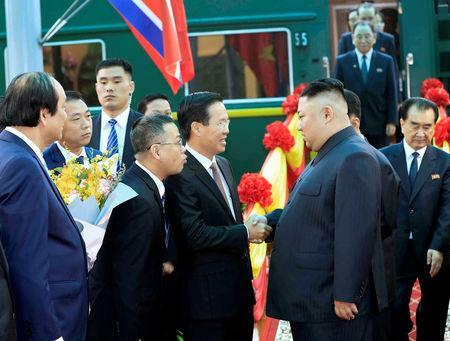 Kim's close aide, Kim Chang Son, who has been in Hanoi for several days preparing for the summit, was spotted at the station before Kim's arrival. His sister, who has emerged as an important aide to Kim and traveled with him from Pyongyang, was spotted getting off the train before he disembarked. Kim will meet Trump on Wednesday and Thursday. Over the weekend, Vietnam announced that it will ban traffic on the road from the station to Hanoi on Tuesday. Kim may be looking to learn from Vietnam's experience of manufacturing products for international companies, meaning a visit to a factory could also be on the cards. A source with direct knowledge of the plan said a high level North Korean delegation is scheduled to visit a plant operated by start-up Vietnamese automaker Vinfast in Haiphong province on Wednesday afternoon. The plan is subject to change. South Korea's Samsung Electronics operates a massive smartphone factory in Bac Ninh, another province popular with Vietnamese and international manufacturers. A source with direct knowledge of the matter said Samsung Electronics had not been informed of any visit by Kim, or instructed by Vietnamese authorities to host him. In Hanoi, North Korean and U.S. flags flew along main thoroughfares and a bridge crossing the Red River into the city. Trump and Kim are expected to meet for their second summit in Hanoi's Government Guesthouse, an elegant, colonial-era building in the city center, or at the nearby Metropole Hotel, sources have told Reuters. Trump will arrive in Vietnam on Tuesday evening. He will meet Vietnam's president, who is also general secretary of the ruling Communist Party, Nguyen Phu Trong, on Wednesday morning, the ministry said. Trump has appeared to play down any hope of a major breakthrough at the two-day summit, saying he would be happy as long as North Korea maintained its pause on weapons testing.